If you've ever tried learning yoga DIY-style, you'd know what it's like to have those moments of doubt whether you're doing the asanas properly in terms of breathing and especially with alignment. 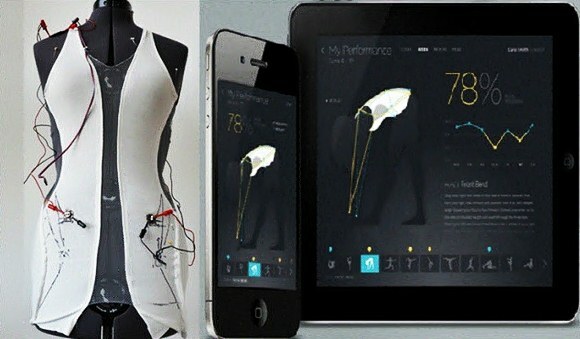 That's exactly what ElectricFoxy's new high-tech yoga shirt aims to help you with. It has sensors built into the yoga top that detect your body's alignment and show you how to correct or improve the way you perform yoga poses. The yoga shirt wears just like any other top you use in your workouts, the only difference is that there are sensors built into the garment that track your movements, postures, and positions. The data recorded by the sensors is sent to the mobile app, which has its own database of, say, Pilates postures and yoga poses. The recorded data is then analyzed by the app, and compared with the existing "posture files" to see which areas of your movement are incorrect. You will see and get real-time data and notifications of your performance. If there is a high discrepancy between your data and the mobile app's (for the pose you're doing), the shirt will generate a buzz, and "nudge" your body in specific areas to get it to the proper angle and alignment. For example, if your left side is too low, you will feel a tap on your left shoulder, so you know where exactly to modify your movement. You can view your data even after your workout, which ElectricFoxy believes is useful for helping you monitor your workout progress and determine areas that need improvement. The workout garment hasn't been getting much positive reviews from yogis and gurus. Among the most common criticisms is the shirt's buzzing and tapping mechanism, and how it will be a distraction during meditation. Yoga is, after all, NOT just a purely physical practice. Another issue would be the cost. ElectricFoxy hasn't released a price tag on it yet, but we're pretty sure this won't come cheap. This workout shirt is part of the brand's Move project, which is basically about developing a variety of "wearable technology garment" that is designed to help you with your performance -- whether it be in yoga, Pilates, dancing, sports, and even physical therapy. ElectricFoxy's main goal with the project is to provide technology that not only can you wear, but can also put more precision in your movements. Those interested can visit the company's website for more information.